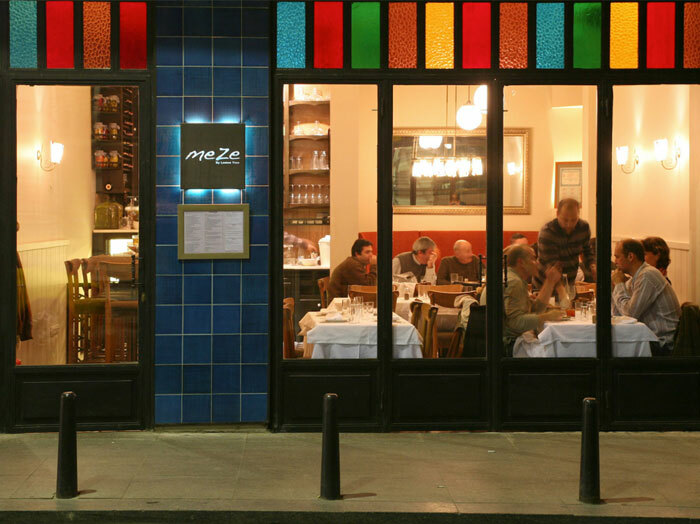 Prominent in Istanbul’s meyhane scene, Meze By Lemon Tree is different from the classic meze joint: it’s very traditional and very modern at the same time. Located opposite the historic Pera Hotel, this intimate, single-dining-room restaurant is based on the idea of creating experimental dishes without straying too far from traditional codes of the Turkish cuisine. Chefs Gencay and Gülabi use classic Turkish ingredients and recipes in order to create fun and inventive dishes. A virtuoso with the skillet, Gencay often pops out from the kitchen to elaborate on the evening’s menu ensuring you aren’t just well-fed, but also well-educated about each and every item on the menu. The dining experience starts with the waiter escorting you from your crisp white-clothed table to the display of meze options, explaining the ingredients enthusiastically and helping you make your choice. There are 14 meze options offered on a daily basis (which are selected from a repertoire of some 50 different mezeoptions) and they change depending on the season’s offerings. One of the mainstays is the excellent şaman bayıldı (fried sweet green pepper filled with cheese from the Ezine region, pistachios, and fresh onion), a must-try with its juicy sweet freshness. Also noteworthy are the smoked trout paté with almonds and mustard, wrapped in grilled leaves of oyster mushroom, and the refreshing sea bass ceviche with lime juice, grapefruit slices, and capers. Hot starters include very tenderly fried calamari, fried beef liver topped with spices and served with sumac-onion salad, and a baked pastry stuffed with cheese, mushrooms, and eggplant. One of the things that sets Meze By Lemon Tree apart is that its dishes are created with wine in mind: most meze options and mains are suitable for wine pairings, and the restaurant has a list of Turkish wines (mainly from the Tekirdağ region) for your enjoyment. Of the mains, the sea bass fillet enveloped in paper with apricots and almonds is a light yet sweet dish and comes highly recommended. If any of the seasonal fresh fish doesn’t strike your fancy, then the wheat pilav with mixed sea food, fresh onions, lemon, bay leaf, white wine, cumin is also excellent. Classic Turkish music plays lightly in the background, contributing to the cozy ambiance, and the multilingual staff is always happy to help with food and wine selections. If you are having some difficulty making up your mind, then the Degustation menu has a fixed price for two people but you will still have to choose between wine and rakı. If you’ve been in search of creative food presented elegantly in a cool atmosphere with impeccable service, you will find your niche with Meze By Lemon Tree. Meyhane aficionados, as well as the newly converted, agree that there is no better place to sip rakı and please your palate with sophisticated modern takes on traditional meze options.